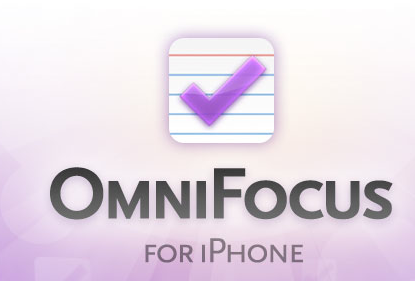 This week I'm going to look at the OmniFocus iPhone application. Unless you fit in that narrow wedge of a Venn diagram including both iPhone owners and OmniFocus geeks, these comments will have absolutely no interest to you. So there you have it. You've been warned. Since the first day I took my iPhone of the box a year ago, I've been waiting for iPhone OmniFocus to arrive. It was, and remains to be, remarkable to me that Apple still hasn't created a native to-do list management system for the iPhone. Well, with the opening of the applications store, and my willingness to part with $20, my wish has finally come true. I have OmniFocus on my iPhone. I have now been using it a few weeks and thought I'd share some of my initial impressions. The most impressive feature of the iPhone OmniFocus application is the robust synchronization accomplished without use of a cute little white cord. That's right, you can synchronize your task list database wirelessly. In order to perform this bit of black magic, you need to upgrade your OmniFocus license on your Mac to the sneaky peek 1.1 version. (You can read my MacOmniFocus Review here.) I know most sane people avoid beta software (I frequently install it with reckless abandon), but in this case it is well worth the trouble. 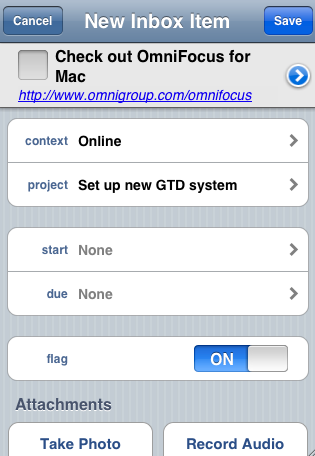 The Mac version of OmniFocus 1.1 allows you to sync your data through your MobileMe or other Webdav account. Once you have trained your Mac application to put your data into your MobileMe account, your iPhone will look at the cloud version and update itself. No cord required. The synchronization process isn't perfect. It takes longer than a wired-based synchronization. Also, sometimes it runs into snags. In that case, OmniFocus will ask you whether it wants you to use the server or local version. The bottom line is that if you're going to do this, you need to respect the syncing gods. There are couple ways to do this. First, you tell your Mac software to backup your data every time you close OmniFocus. That way, you have numerous backups of your OmniFocus data in case the gods become angry. Second, don't tell everything to sync at once. Technically this is possible, but its really like when the Ghostbusters crossed the streams. Very bad things could happen. With these precautions in place, syncing is great. The Omni people get a MacSparky thumbs up for the sheer moxy to pull it off. I am certain this process will get even easier and better over time but it is entirely workable right now so long as you take a few precautions. So once I have the data on my iPhone, what do I do with it? 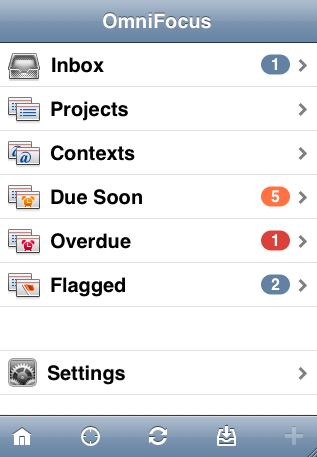 This is where the current version of the OmniFocus iPhone software comes up a little short. The application allows you to manipulate the data in your iPhone and make changes to your tasks. Making changes is quite often, however, awkward. For instance, moving the start date on the iPhone requires several button taps and scroll wheels. Strangely, the process of changing the date also changes the start time and requires more steps to set right. Put simply, the interface needs work. The Omni engineers have to figure a way to make data manipulation just as easy on the iPhone as it is on the Mac without benefit of a mouse and keyboard. I don't envy them. I think what they have is a good start. I hope they continue to refine it. I suspect they will. The flashiest feature is the location aware function. 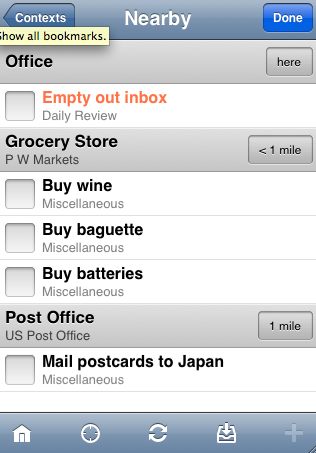 OmniFocus on your iPhone can look where you're at and provide you tasks available for nearby locations. This even works on 1st generation iPhones such as mine. For instance, when you are in front of a market, it can give you your grocery list. A lot of people are excited about this function. I get that this is really tricky, but I've yet to really find a use for it. When I want to buy my groceries, I go to the market. I don't need my phone to tell me. Maybe as I use this more, I'll find a better use for it. If anybody's got any ideas, e-mail me. I'd love to hear them. So despite my gripes about the user interface, I have to say I can't imagine living without OmniFocus on my iPhone now that I've had it a few weeks. Every morning, after I get my daily tasks set up, I sync everything to my iPhone and it is very satisfying knowing that I have that list in my pocket at all times. I can check items off and, with a little work, adjust them on my iPhone and it will integrate with my database on my Mac. I'm convinced this will become even more useful as the Omni gang continues to polish and enhance the application. At $20, this is one of the more expensive iPhone applications. However, if you've made it this far in the review, you probably are an OmniFocus nerd so stop kidding yourself and just go buy it.